Persistence Market Research (PMR) analyzes the global guerbet alcohols market in a new publication titled “Global Market Study on Guerbet Alcohols: 2-octyldodecanol Product Type Segment Projected to Account for Significant Market Share Between 2016 and 2024 ”. This study provides data for 2015 along with the forecast for the period (2016–2024). The main objective of the report is to identify dynamics in the market and provide recent updates and insights affecting various segments of the global guerbet alcohols market. To provide better understanding of the market, the report also includes the analysis of drivers, restraints, trends on all five regions, namely, Asia Pacific North America, Europe, Latin America and the Middle East & Africa which influence the current market scenario and future status of the global guerbet alcohols market over the forecast period. To understand and assess market opportunities and trends, the global guerbet alcohols market report is categorically split into different sections based on market segmentation – by product type, by end use, and by region. The report starts with the market overview and provides market definition and taxonomy along with value chain, pricing analysis region wise, drivers, restraints, and trends in the market. The sections that follow include global guerbet alcohols market analysis – by product type, end-use, and regional/country level analysis. All the above sections evaluate the market on the basis of various factors affecting the market. Each section discusses the qualitative and quantitative aspects of the global guerbet alcohols market. To give a brief idea about revenue opportunities from the product type, end-use and region/country-wise segments, the report also provides volume (KT) data, absolute $ opportunity, and total incremental opportunity for each segment over the forecast period (2016-2024). In the final section of the report, we have provided the global guerbet alcohols market structure and a detailed competition landscape with company market share and performance, to provide report audiences with a dashboard view of key players operating in the global guerbet alcohols market along with their business strategies. This would enable clients to assess strategies deployed by market leaders and help them develop effective strategies accordingly. For market data analysis, we have considered 2015 as the base year, with market numbers estimated for 2016 and forecast made for 2017–2024. To calculate the market size, the report considers the weighted average price of guerbet alcohols, based on product type grades such as 2-butyloctanol, 2-hexyldecanol, 2-octyldodecanol, 2-decyltetradecanol, 2-dodecylhexadecanol and others across key geographies on a regional basis. The forecast assesses the total revenue (US$ Mn) as well as volume (Tons) of the global guerbet alcohols market. To deduce market volume size, consumption of guerbet alcohols has been considered. In order to provide an accurate forecast, we have started by sizing up the current market, which forms the basis of how the global guerbet alcohols market is expected to develop in the future. The critical market data, including the base number and segment splits, has been devised through in-depth secondary research. This data is then triangulated on the basis of different verticals, considering both supply side and demand side drivers and other dynamics of the various regional markets, along with primary interviews of manufacturers and industry experts operating in the global guerbet alcohols market. The forecast presented in the report evaluates the actual consumption of guerbet alcohol and expected consumption in the global guerbet alcohol market over the forecast period. We have also analyzed the different segments of the global guerbet alcohols market in terms of basis point share (BPS) to understand individual segments’ relative contribution to market growth. This detailed level of information is important for identifying the various key trends governing the global guerbet alcohols market. The report also analyses the global guerbet alcohols market based on the absolute dollar opportunity. This usually overlooked while estimating the market forecast. However, from a sales perspective, it is essential to identify absolute dollar opportunity is essential to identify potential resources in the guerbet alcohol market. PMR has developed a market attractiveness index to understand the key segments in terms of their performance and growth in the global guerbet alcohols market. This market attractiveness index would help clients to identify real market opportunities in the global guerbet alcohols market. The final report is a milieu of crucial information fetched through extensive research. The primary and the secondary research played a crucial part in gauging the evolving market behavior within the forecast period. The market is niche and the chemical has its own genetic qualities that makes it popular amongst the major end-users present in the market. Guerbet alcohols derivatives such as ethoxylates are a safer alternative for the cosmetic industry and they are presently widely accepted across the market. The inbuilt safer qualities and nature-friendly components present in guerbet alcohols will open newer avenues of growth for the market even in regions that are presently dominated by halal cosmetics. The market expansion of the global guerbet alcohols market is somewhat walled by high prices. Guerbet alcohols are highly priced and most of the manufacturers are based across Europe and North America. The market growth is comparatively slow in the Asian markets. Guerbet alcohols also known as 2-alkyl-1-alkanols are a class of highly branched long chain fatty alcohols (C12-C36), first produced by Marcel Guerbet. The reaction sequence is associated with the aldol reaction under the presence of alkaline catalysts and occurs at high temperature. Guerbet alcohols have high molecular weight and due to branching, they possess low irritation properties, low volatility, low melting point, improved biodegradability, and give better stability over linear or unsaturated alcohols containing the same number of carbon atoms. The global consumption of guerbet alcohols was estimated to be approximately 106 kilotons in 2015. Sales revenue of guerbet alcohols is expected to register a CAGR of 5.6% over the forecast period (2016–2024). Guerbet alcohols are used as cosmetics ingredients to provide multifunctional properties. They act as a super fattening agent, emulsion stabilizer, perfuming agent, viscosity increasing agent, and binder. Guerbet alcohols exhibit relatively good oxygen permeability that is an essential property for skin applicants and is used to make cosmetics emollients. So, increasing use of guerbet alcohols as a multifunctional cosmetic ingredient is anticipated to surge its consumption in cosmetics and personal care industry and is considered as the major driving factor for the growth of global guerbet alcohols market. Additionally, use of guerbet alcohols based ethoxylates across a myriad range of industrial applications is expected to drive the growth of guerbet alcohols market during the forecast period. However, higher prices associated with guerbet alcohols and their derivatives are in turn expected to act as an impediment to the growth of global guerbet alcohols market. The global guerbet alcohols market is segmented on the basis of product type, end use and region. On the basis of product types, the global guerbet alcohols market is segmented into 2-butyloctanol, 2-hexyldecanol, 2-octyldodecanol, 2-decyltetradecanol, 2-dodecylhexadecanol and others. Based on the end use, the global guerbet alcohols market segments into cosmetics & personal care, metal processing, detergents & cleaners and others. Key regions covered in the report includes North America, Latin America, Europe, Middle East and Africa (MEA), and Asia Pacific. 2-octyldodecanol is projected to account for 33.6% value share in the global guerbet alcohols market by 2024 end, increasing at a CAGR of 6.7% over the forecast period. This is attributed to increasing demand for 2-octyldodecanol globally in cosmetics & personal care industry. 2-0ctyldodecanol is used as a medium spreading emollient and due to its chemical structure, it is suitable for all formulations such as antiperspirant/deodorant and hair remover formulations where a wide pH range is required. 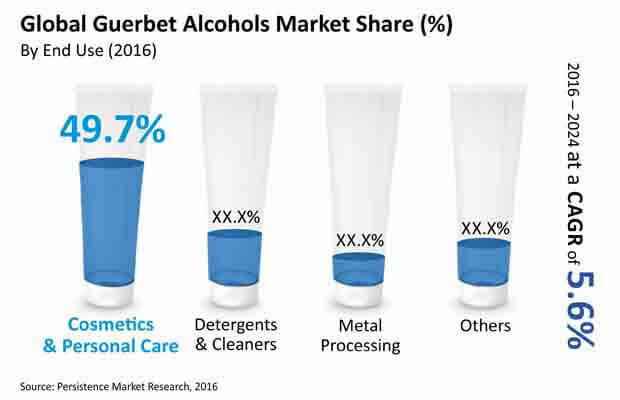 Among end use industries, cosmetic & personal care segment dominated the global guerbet alcohols market in 2015 and the segment is forecast to account for 53.1% market value share by the end of 2024. The growth of the segment is largely attributed to its increasing demand of guerbet alcohols used in skin care preparations, hair conditioners, cleansing product in cosmetics & personal care industry consumption of guerbet alcohols in cosmetic & personal care segment is estimated to be pegged at 54.5 kilotons by the end of 2016. From a regional perspective, Europe is estimated to represent 26.2% in 2016. The market is expected to increase at a value CAGR of 5.1% over the forecast period. Sales revenue of guerbet alcohols in North America is expected to reach US$ 372.2 Mn by the end of 2024, increasing at a CAGR of 5.3% over the forecast period. Market growth in Asia Pacific region is expected to remain high compared to the global average between 2016 and 2024. Some of the key players reported in this study of the global guerbet alcohols market include Sasol Ltd, BASF SE, New Japan Chemical Co., Ltd, Kisco Ltd., Kokyu Alcohol Kogyo Co., Ltd, DowPol Corporation.